Looking to invest in scaffolding and height access equipment in the industrial sector? With over a decade of experience designing, engineering and manufacturing industrial stairs and height access solutions, SafeSmart Access has a unique insight into the specific requirements present within industrial projects. Our off the shelf range surpasses Canada's safety compliance regulations, ensuring that your worksite is safe, and risk of ownership reduced. Working on a Particularly Challenging Site? Most other crafts and trades depend on scaffolding, making our work the foundation for your success. Our team take this responsibility very seriously. We've developed a streamlined scoping and design process that ensures a clear assessment of the limitations and opportunities presented by your site. Learn more about our custom solutions and the process we undertake to ensure that we present you with the most cost effective and safe solution. Speak to our team about your requirements today. Give us a call or enquire online today. Aluminum Scaffolding – Looking for lightweight and mobile solutions? Look no further. Steel Scaffolding – Our Proscaf system is versatile, easy to assemble and will decrease down time onsite. Ladders – Industrial step ladders, flexible fold-away extension ladders, heavy duty platform ladders and more; SafeSmart has it all. 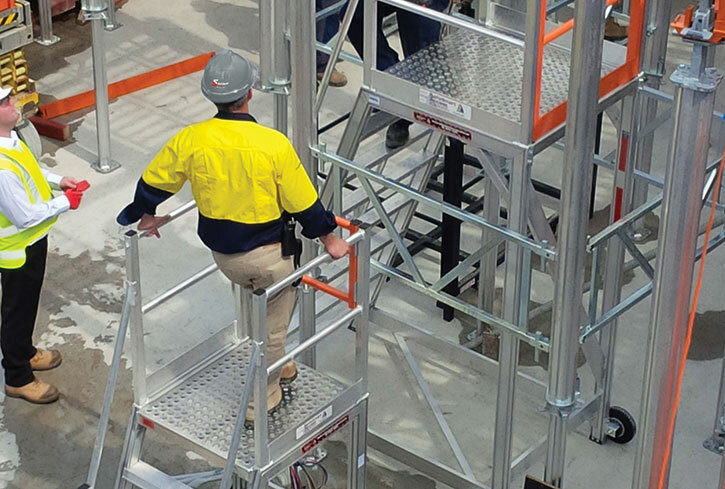 Portable Height Access – industrial stairs, Mini Mobile Scaffolding, cantilever access and more. We've worked with blue chip clients across the globe, tailoring access equipment to industrial worksite requirements. We've been a trusted supplier of scaffolding across construction, mining, and defence sectors. Our history speaks to our quality, productivity, and safety assurance – onshore, offshore, domestically and overseas. When you work with SafeSmart you can rest assured that you're partnering with a business that gets personally invested in the success of your project. Our approach puts you, and your project in the centre of the solutions we put together. Learn more. Inquire today for more information on our custom capability.